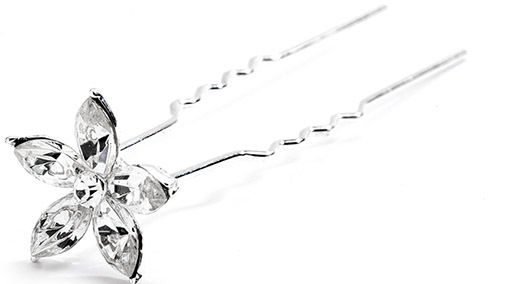 * Our silver hair pin features a single flower made of sparkling marquis-shaped crystals. * This elegant hair stick features a 5/8" w crystal flower perched on top of a 2 3/4" h pin. * Whether your wear it alone or combine it with other hair sticks, this pretty accessory will add the perfect sparkle to any garden or beach wedding!